On a January day in Downtown Summerlin, someone passing by the vacant suite 280 would have seen nothing more than vertical poles to mark the room borders, dust-covered gray floors and foil-covered exposed walls. But Paige and Stephanie Melanson saw more. In this space, they could grow their dance studio, Dance Dynamics, then located inside a strip mall at Charleston and Rainbow boulevards. They could host more dance camps, sell clothes in the front and place computers in the back for the students to finish homework. Their mother, Rosemarie, would work the front desk, as she did at their strip mall studio. She could remain the first and last face to greet the kids. "It's a different level," Stephanie said. "We dreamed of this since we were kids," Paige said. January marked three months since the Oct. 1 shooting that changed the Melanson sisters' lives. Paige and Rosemarie Melanson were among the more than 800 people injured during the shooting at the Route 91 Harvest country music festival. Rosemarie was struck in the chest. Paige had shrapnel in her arm. The sisters faced a pivotal time for their growing business, balanced with their mom's hospital stay and their own physical and emotional healing. The sisters had brought their mom to the Route 91 festival as a Mother's Day present. It was Rosemarie's first time. Stephanie and Paige had gone every year since its start. The strip mall studio was closed the day after the shooting. Even with the studio closed, parents of Dance Dynamics students gathered to pray for the Melanson family. Classes started again Oct. 3. The sisters returned after about three weeks. "We had a business to run," Paige said. Paige felt pain in her arm where she was hit. She had nightmares, flashbacks. The noise of loud cars unnerved her. Stephanie woke up at night screaming and crying. She hated the gunman. She hated leaving Rosemarie inside the festival grounds at the urging of a retired firefighter, who saved the elder Melanson. Stephanie thanked God it wasn't the last time she saw her mom. "I get distracted in the studio," Stephanie said. "It's easy to tune other things out." The family shared their story on TV and in newspapers. So did Stephanie's boyfriend, Aaron Stalker, the Army veteran who saved lives, and her father, Steve, the man by his wife's side as she recovered. Paige and Stephanie's brothers stayed out of the spotlight. Business continued. Dance Dynamics held its annual Halloween party — Stephanie as the Wicked Witch of the West, Paige as Glinda the Good Witch. The studio offered free shipping on goods to encourage Black Friday sales. 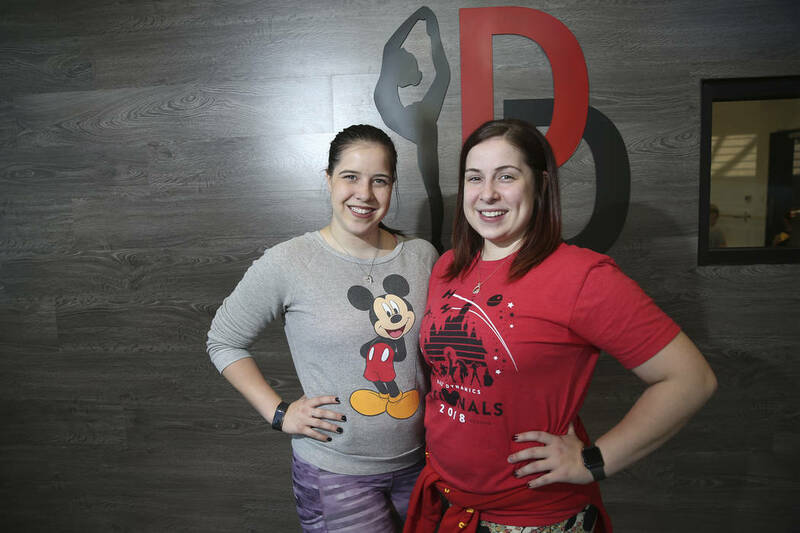 The sisters said Tory Teunis and Gina Russo, whose 10-year-old daughter has danced with the Melansons since she was 3, helped the business stay on track and market the new studio during this time. "At the beginning, it was more just about trying to help," Teunis said. "But I said if you are going to get a lot bigger, I have to come on as a partner." He and Russo had started working with Dance Dynamics before the shooting. Teunis helped them develop their technology infrastructure, along with ways to market themselves online and process sales. After the shooting, they helped the Melansons keep track of the building process for their new studio in Downtown Summerlin. Meanwhile, the Melanson family focused on Rosemarie's healing. They celebrated Christmas with her in the hospital. She could laugh at jokes again. She had taken her first steps — seven of them — that month. Dance Dynamics hosted its last dance class of 2017 on Dec. 23 at the strip mall location. By this time, the Summerlin space looked more like a business. Panels gave form to walls separating the rooms. A black blind outside hid all the construction. Classes resumed Jan. 8. Some younger students gave Stephanie drawings. "We will always be together" was written inside a purple heart. Stephanie encouraged the kids to practice their dances to show Rosemarie if she visits. After surgery, TV cameras recorded Rosemarie leaving the hospital and going home. Two days later, complications forced her to return. At the Summerlin studio, white paint coated the walls. In March, the county issued a temporary certificate of occupancy. Wrapping covered the space for silhouetted windows where parents could look into class without distracting the kids. Paige had taken charge of the vendor accounts her mom handled. She got costumes delivered. She had to explain the shooting to an email operator to get the password to her mom's account. Stephanie did not think about the gunman anymore. She would take one day off work each week for herself. Just a day to do errands and relax. The shrapnel in Paige's arm eventually fell out. She saved the metal. She might have needed it for a lawsuit, she said. Paige sometimes wished the gunman hadn't killed himself. If she could, she'd ask him, "Why?" She'd have days of rage and then calm down. "I hate the feeling," Paige said. "But I can't change my circumstances." In April, the studio performed a dance tribute to the shooting in Garden Grove, California, at the NRG danceProject convention and competition. A judge for the dance, NRG faculty member Mallauri Esquibel, praised the dance as graceful and brave. "The most beautiful part of dance is we are able to express any emotion and tell a story through movement without having to say a word," Esquibel said. "These dancers did that perfectly." The dance, "One October," was performed throughout the competition season. It won two choreography awards. Rosemarie watched the dances through an online stream. She posted to Facebook for the first time since October. Assisted by a walker, Rosemarie visited the strip mall studio April 21. "You guys can hug me," she told the students. By then, Teunis and Russo's roles had evolved from marketing and moving logistics to interviewing staff, designing camps as a new revenue stream and other day-to-day operations. The Summerlin Dance Dynamics sign went up that month. Wallpaper and floors were installed, along with ballet bars, mirrors and projectors. The black blind came down. The studio opened before May. "The past six months have been a blur," Paige said. By this time, the shooting sometimes felt like it happened last year and sometimes last week. Paige avoided action movies. The guns made her anxious. Rosemarie had her 10th surgery in May, supposedly her last, to stop a leak in her abdomen. The doctors sometimes told the sisters too much. Sometimes they shared too little. Paige and Stephanie could see the shrapnel in their mom's chest X-rays. Paige kept the red flannel shirt she wore Oct. 1. Stephanie's boots, with a cross and angel wings, sat in her bedroom by the door. Summer break for Clark County schools didn't mean a break for Dance Dynamics. The studio held auditions for its third dance season since its founding. The Summerlin location allowed the studio to host camps, with prices ranging from $175 to $225. Some camps were themed around dance, others around artwork or the video game "Minecraft." Kids in tights and their parents filled the halls of the new studio. A large V-shaped gray couch sat in the back with a set of laptops on a table and cubbies and lockers to store personal items. Doctors scheduled Rosemarie's 12th surgery for November. Then they moved the surgery up to Sept. 4. She would remain in the hospital until then. By this time it was August. The last class before school started. Four months since opening day. Ten since the shooting. A year since the sisters announced the move on social media. Squeaky-voiced pop song covers blared from a speaker in the ballroom. Stephanie dished out inspiration and discipline in equal parts to her students. "It's OK if we're wrong," she told her class. "That's how we learn." Stephanie ended the class with a new move for the children: the pas de bourree. They started with one leg stepping behind the other — "closing the door," Stephanie called it. Next, the dancers uncrossed their legs, opening the door. And finally, the dancers took a step forward. "Walk through the door," Stephanie said.